PennsylvAsia: No Game No Life Zero (ノーゲーム・ノーライフ ゼロ) coming to Pittsburgh theaters in October. 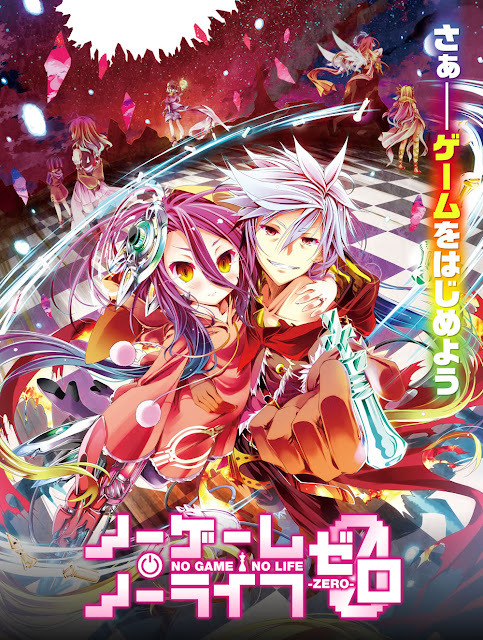 No Game No Life Zero (ノーゲーム・ノーライフ ゼロ) coming to Pittsburgh theaters in October. Six thousand years before Sora and Shiro were even a blink in the history of Disboard, war consumed the land, tearing apart the heavens, destroying stars, and even threatening to wipe out the human race. Amid the chaos and destruction, a young man named Riku leads humanity toward the tomorrow his heart believed in. One day, in the ruins of an Elf city, he meets Shuvi, a female exiled "Ex-machina" android who asks him to teach her what it means to have a human heart. In select movie theatres nationwide, this two-day event also includes exclusive content featuring special footage of members of the cast and crew of No Game No Life Zero. According to the distributor, the October 5 show will be subtitled and the October 8 dubbed, but local Cinemark theaters are currently advertising both versions on October 8. The movie is set to play at the Cinemark theaters in Monaca, Monroeville, North Hills, Pittsburgh Mills, and Robinson.